This is it, folks: the death march of the sports year. The NBA is over, football is still 8 weeks away, and unless you’re a die hard baseball fan who can watch all 162 games, you won’t give a damn about anything until September. Which means it’s time to get some sanity back and start looking ahead at the upcoming (or 5 months out) Flyers season and the new troops Archie added to the squad. We’re going to bring as much content as we can throughout the summer to keep Sweater Nation™ salivating for this season, and what we’re all expecting to be another hell of a ride. Over the next several days we’ll be featuring a series of short blogs on every new player who will toss on the Red and Blue this fall. So buckle up, kick back, and enjoy this presentation of highly in-depth hoops analytics and photo edits. Can’t help but hope that nickname comes from his soon-to-be performance from behind the arch. Charles Cooke announced his transfer last year from James Madison University where he played two seasons for the Dukes. After announcing his intentions to transfer, it was between Michigan State, Rhode Island, and Dayton. Not the first recruiting victory for Archie vs. a Big Ten school either, which we’ll get into later on. After sitting out last season due to NCAA transfer rules, you have to hope the kid wants to come out flying. He started 40 of 62 games at JMU, clocked 1,781 minutes and averaged 14.3 ppg his sophomore season (613 total points in two seasons) which earned him Third Team All-Colonial Athletic Association. He shot .415 from the field and a solid .718 from the line. Despite sitting on the bench last season, this November won’t be Cooke’s first game on UD Arena’s floor. JMU reached the NCAA’s during his freshman season, after a 25-11 campaign placed them in the first round at UD Arena vs. LIU and a second round game vs. Indiana. Cooke scored 15 and 18 in those games, respectively. 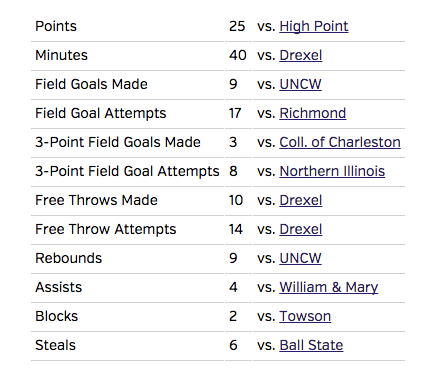 Summary: We only have two fairly decent seasons in the Colonial Athletic Association, composed of teams you can see in the stats above, to judge. But one thing’s for sure: Cooke likes to shoot, and while he’s still pretty raw, let’s not forget the last time Archie had a transfer come in with an entire year to work on that part of his game. With a full year of practice with the team already under his belt, there’s no reason to not have high hopes for him this season. Cooke was a member of UD’s “Core Four” (pictured) that led the Flyers to an NCAA tournament appearance.